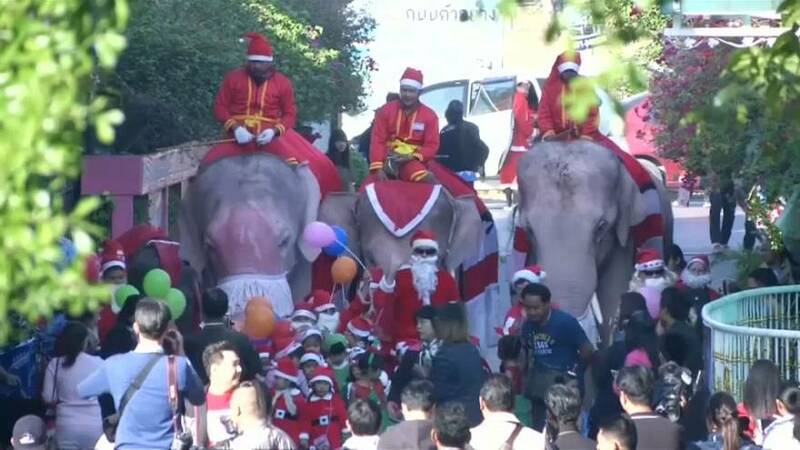 Elephants from Ayutthaya Elephant Palace and Royal Kraal in Thailand's ancient capital dressed up as Santa Claus and visited a local school on Friday, spreading Christmas cheer and handing out presents. Students at Jirasartwitthaya school eagerly awaited the annual visit along with special guests. Four elephants, including a three-year-old baby, handed out dolls, balloons and snacks with their long trunks and entertained children with special dances. Thailand is a predominantly Buddhist country, with Christians comprising only about 0.7 percent of the population. While Christmas is not an official holiday in the country, many commercial outlets and people have adopted various aspects of the tradition.